The cheerful daylily is a cornerstone in many perennial gardens. Its virtual summer to frost profusion of blooms, bright color, and ease of care are attractive to any gardener. What many gardeners don't know, is that hemerocallis fulva, known as "gum jum fa" (golden needle flower) is a delicacy enjoyed in Chinese dishes. The unopened buds have a sweet taste, a crisp "song" (best understood as al dente) texture, and a versatility enjoyed in salads, stir-fries, soups, and noodle dishes. If you're not already growing daylilies, you probably know someone who is. Because the plants naturalize freely, your friend or neighbor would likely not mind dividing and sharing with you. If you need to buy your own, choose the common daylily or the tiger lily. They are always available from garden catalogs or garden centers. Daylilies have fleshy tuberous roots that should be set at the same level they were growing (if transplanted) with the crown just below the soil level. Daylilies are not only easy to move, but easy to care for. Compost dug into the planting hole is appreciated by any plant, but beyond that, daylilies are not fussy. After planting, water in well. They'll quickly become accustomed to just about any soil and are hardy in most of the United States. Daylilies are aptly named because although the flowers are thick, appear hearty, and seem to last for weeks, each flower lasts for only one day. It is simply the sheer number of blooms that gives the impression they are so long-lasting. For eating, the buds are picked when plump on the morning just before they open. Because daylilies bloom from summer to frost, buds will be available for picking whenever the cook needs them. They can also be harvested and air dried for use after the flowering period. To prepare daylily buds for eating, gently squeeze open the tip of the bud and carefully pinch off the pollen covered anthers. Before cooking, soak/rinse carefully to remove any hidden insects or debris. If the ease of a carefree and gorgeous flower multiplying quietly in the corner of your garden does not appeal to you, or if you simply do not have room for another plant, daylilies for cooking can be purchased at Asian supermarkets. The "gum jum fa" can sometimes be found fresh, but is often sold dried in a bag or brick. Dried daylilies simply need to be rehydrated by soaking in cool water for about half an hour. Sometimes, cooks will rehydrate dried flower buds and tie a knot in the middle to add body and bulk that is somewhat lost during the drying process. Daylilies have a sweet flavor and appealing texture, making it easy for the first-timer to enjoy. The biggest (and probably only) hurdle is to get over the fact that you're eating flowers! Then again, think of all the other flowers and flower buds you typically eat - broccoli, asparagus, artichoke, or perhaps even nasturtium or other flower petals... Though daylilies are versatile in the kitchen, I have enjoyed them in a white noodle soup with black mushrooms and sliced pork, and Chinese leeks. 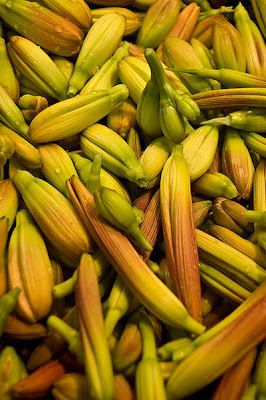 The recipe below uses daylily buds in a typical Chinese stir fry. Marinate chicken in soy sauce, sugar, cornstarch, sesame oil, and white pepper. Just before cooking, add a drizzle oil to chicken and stir. This will keep chicken pieces from sticking to each other. Add oil to wok. Quickly cook chicken over high heat, then remove and set aside. Cook carrots and celery. After a few minutes, add garlic. Cook until vegetables are soft. Add cooked chicken, wood ear, and flowers. Continue to stir fry for a few minutes until heated through and buds soften and wilt. When done, the buds will be wilted, soft with a pleasing texture, but not mushy. Add water/cornstarch mixture. Continue to heat until sauce thickens. Add more salt or soy sauce to taste, if desired. Add cilantro, stir to incorporate and remove from heat. Serve with rice. Wonderful....and wild!! very cool.. I didn't know you could eat those..fabulous! A wonderfully inspiring post! I love that you are showcasing your recipes..I look forward to them. This one definitely gets bookmarked for when the daylilies are in bloom this summer! I did know you could eat them but never got around to looking up a recipe. Hi, this post will be very useful to many. I dont know if we have daylilies here but maybe the dried ones are available in Chinese stores. The recipe sounds enticing and yummy as i love Chinese food too. Hi Wendy~~ You are such an adventurous cook. I'll have to bookmark this too. I've never heard of eating daylilies! What a great post Wendy! You've opened my eyes. I have copied this to bring out once my day lilies reach critical mass...at which time the slugs won't be the only ones nibbling on them. Hey, Wendy. I have always thought that gum jum fa is safron plant. Now I know better, thanks to you! I just bought a yellow daylily plant from a local nursery but I didn't believe the guy when he said it was gum jum fa. I love it when it is cooked in vegetarian dishes with the 'nam yu', a red coloured preserved bean curd. Yummy, yummy. Wendy, my post today is about a yellow daylily and I link to your post today. Hope you don't mind. I love all your "Growing, buying, cooking" posts! I am surrounded by many of these foods in the local markets here, but I have no idea what to do with any of them. We live in a largely Polynesian area, so the foods used by my neighbors and such are a little different. Thanks everyone - I hope you get to try it! I would suggest if you're going to eat what's typically ornamental, do try to keep organic practices though! Stephanie - your recipe sounds completely different from mine, but also like something my mom would make. I've got to try it! Autumn Belle - I'll have to check out your post! You're right about the daylily in vegetarian dishes. It's a perfect complement to tofu, beancurd, etc. WOW!!!! What an informative post. I must confess that I grew up eating these tasty buds. However, I always thought they were from some exotic Asian plant and would have never guessed that it was a run of the mill daylily. I have wild ones growing in my yard! I've been learning so much from your posts. Thanks! Xiao Yen - your recipe sounds like something I may have had before. Thanks for visiting! I didn't know you could eat that flower / plant. I first tried day lilies in '96 simply sauteed them with oil and a bit of soy sauce for taste. That was the last time because they can make you "go". Told my parents that they were edible and the lilies had the same affect on them. Good thing they have two bathrooms! How do you spell bug?